What is the single most crucial customer support metric? Well, there’s no definitive answer – but that’s not necessarily a bad thing. Every customer service team has its own set of unique challenges, goals, strengths, and weaknesses. This means your company has its own set of support metrics that are most useful and relevant – and what those specific metrics are depends on your priorities and objectives. 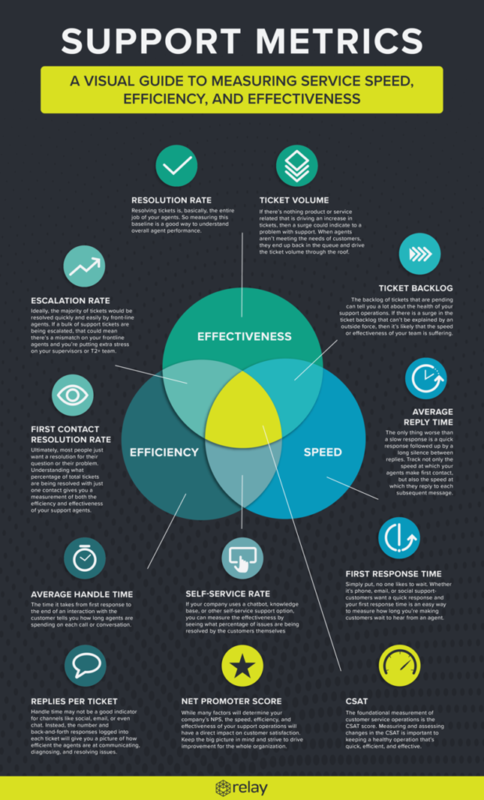 The infographic below breaks down which metrics you can use to evaluate your customer service operations on speed, efficiency, and effectiveness. Faster resolutions make for happier customers. So, one of the fundamental aims of your customer service team could be to get each job done as quickly as possible. Here are the metrics you should focus on if increasing speed is your top priority. A measurement of how long it takes your team take to respond to a customer’s initial service request. When someone calls or requests support online, their first impression of your customer service team is going to be largely colored by how long they have to wait for a response. How long you take to respond to all customer communications – including every interaction from first contact to resolution. Even if you can’t offer an immediate solution or answer, your customers still expect you to acknowledge their message ASAP – even if it’s just to say that your team is still working on it. Speed alone does not equate to fast resolutions. If your agents’ time is not being used efficiently, then your team and your customers are both wasting time. But speed plus efficiency? Now, that’s a winning combination. One metric in particular sits at the intersection of these two pillars: your self-service rate. The percentage of customer issues that customers resolve themselves with the help of self-service resources. Whether your company offers an online knowledge base, chatbot support, or other self-service tools that reduce the number of requests that reach your agents, you should track how many customers opt for those low-touch support options. If your team works quickly enough, but you need to isolate measurements for efficiency, these are the two metrics you’ll want to focus on. The time it takes a customer request to go from initial contact to total resolution. This metric reveals how long it takes agents to fully resolve each ticket and helps identify bottlenecks that are backing up your team’s efficiency. This measures how much back-and-forth there is between customers and your agents during the resolution of an average ticket. It can be a more valuable metric than handle time you’re tracking less traditional forms of support, like social media messages, SMS, email, and live chat. If support issues frequently get passed around from agent to agent, not only do your customers suffer, but your customer service operations will struggle to improve in efficiency and effectiveness. The rate at which tickets are escalated to higher tiers. A high escalation rate suggests that tickets are not being matched to the right agents or that your front-line agents are ill-equipped to handle the majority of requests. What percentage of tickets are resolved by a single response? If tickets are often handled at the very first touch point, your team is working very efficiently. More importantly, if those customers never need to call back with a follow-up question to their original issue, your team is delivering long-term solutions. If you know that your team is using their time efficiently, but aren’t sure that they’re producing effective results, you need to look at how well your agents are able to handle incoming service requests. In particular, there are two key metrics you should focus on. The percentage of total tickets that your team resolves in a given timeframe. This is a baseline measurement for how effectively your agents are doing their job. The amount of customer service requests received during a given period. Tracking this metric ensures you’ll notice when volume surges or drops – and will be able to understand how changes to your product or support operations impact the number of incoming complaints and questions. If you’re concerned that your team is struggling both in terms of speed and effectiveness, the solution might involve changes to scheduling, offering more self-service options, or altering your priorities to resolving more tickets in less time. The most telling sign that your team needs to improve in these areas? A large or growing ticket backlog. How many tickets are sitting in the backlog waiting to be addressed? The greater your backlog, the bigger your problem – because it means your team is unable to handle the number of incoming requests received during a given time period. The ultimate goal, of course, is to improve your customer service operations across the board, not just in certain areas. Want to measure how well your team is performing in terms of speed, efficient, and effectiveness? There are two important metrics will only be on the rise when your team has optimized for all three of these variables. A measure of how likely your customers are to recommend your product or service to another person. Your NPS tells you how your customers feel about their experiences. How satisfied are customers, on average, after interacting with your customer service team? This insight can reveal whether your overall speed, efficiency, and effectiveness are contributing to positive customer experiences. Want more advice on improving your customer service operations? Sign up to receive monthly updates on the latest and greatest content from our blog, sent straight to your inbox.